South Africa pulverized Australia by a mammoth margin of 492 runs at the Wanderers to win the 4 Test series 3-1. This was their first Test series win at home against the Aussies since readmission. They began the series on a bad note, losing the first Test at Durban by 118 runs, but bounced back in sterling fashion to win the next 3 Tests in a row. Australia competed well in the first two Tests but faded away as the series progressed. Here are 7 reasons why South Africa emerged victorious in the Test series. SA’s bowlers kept Smith and Warner quiet. While every team has a few marquee players whom they depend on to win matches, no team can afford to rely on just these few players to post huge totals. Everyone needs to make some contribution. Steve Smith has had a dream last 4 years and has scored heavily enough to invite comparisons with the late Don Bradman. David Warner has also been very prolific. In this series Warner and Smith averaged just 36.16 and 23.66 respectively and managed just 3 fifties in 12 innings between them. This cost Australia dearly. None of the other batsmen in Australia’s top 6 stepped up to score consistently and Australia were always struggling to post competitive totals. Australia had taken a 1-0 lead in the series and were 98 for no loss batting first at Port Elizabeth. They looked set to score at least 350 and take an unassailable 2-0 lead in the series. But an inexplicable collapse saw them bowled out for 243, giving South Africa the upper hand. South Africa limped their way to a target of 101 in the 4th innings to win the match. A target above 200 would have made it extremely difficult for the Proteas to square the series. Australia did not register a single century in the entire series. Both teams have strong bowling attacks and the series was played on wickets which favored the bowlers. This, coupled with the fact that most batsmen were out of form, meant that this was always going to be a low scoring series. That in no way hides the fact that Australia’s batsmen were extremely poor with the bat. Australia has played 106 Test series that have had a minimum of 4 Tests, out of which this is just the 3rd where Australia’s batsmen did not manage to score a single century. That shows their ineptitude and was one of the main reasons for their series loss. Until the 3rd day of the 3rd Test, Australia were in with a chance to win or at least square the series. However, they were dealt a crippling blow when the ball-tampering saga unfolded. Australia were struck a body blow when 3 off their best batsmen were banned for the 4th and final Test. Not only were their replacement batsmen jet lagged and rusty, the psychological damage and the negative publicity of the entire incident followed by the public breaking down of the main protagonists affected the entire team, who suffered their 2nd heaviest defeat in terms of runs at Johannesburg. Rabada was the highest wicket-taker in the series with 23 scalps to his name. He began the series in devastating fashion, taking 15 wickets in the first 2 Tests before being banned for the final 2 Tests because of allegedly intentional body contact when he dismissed Steve Smith at Port Elizabeth. When the ban was overturned, Rabada played the last two Tests. Even though he took only 8 wickets in the last two Tests, with Dale Steyn injured and Lungi Ngidi and Morne Morkel nursing injuries, Rabada’s absence would have left a huge void in the Proteas bowling attack, rendering them nearly toothless. South Africa were given a huge fillip when his ban was overturned. That resulted in Morkel and Philander enjoying the support that enabled them to put in improved displays on the field. Even though Aiden Markram was the top scorer in the series, there is no doubt that AB de Villiers was the most influential batsman on either side. He scored a century and 4 fifties in 8 innings and always seemed to have an answer to whatever the Aussie bowlers threw at him. Throughout the series, there were instances where the Aussies were on top. Mitchell Starc was almost unplayable in the first 2 Tests with his reverse swing. Almost every time he strode to the crease, AB counterattacked or stonewalled depending on the situation and played Starc with aplomb. AB scored 417 runs at an average of 71.16 and a strike rate of 65.19 to help his team come out on top. Prior to this series, AB’s strike rate in Tests was 54.06. The fact that he scored at such a high pace in this series showed he was willing to take the bull by the horns and make his presence felt. Among the Aussie bowlers, only Pat Cummins came to the party. In the recently concluded Ashes, 4 Australian bowlers took at least 20 wickets each. It was a complete and clinical performance by the Aussie bowlers that enabled them to win the series 4-0. In this series, only Pat Cummins was at his best and he fought a lone battle taking 22 wickets at 21.45. The other bowlers –Nathan Lyon, Josh Hazelwood and Mitchell Starc– were off-color and averaged from the mid-30s to early 40s with the ball, leaving Cummins bereft of support. Even though Lyon was the 2nd highest wicket-taker for the Aussies and reached a career milestone of 300 Test wickets, he averaged 42.56 which is extremely high for any bowler. 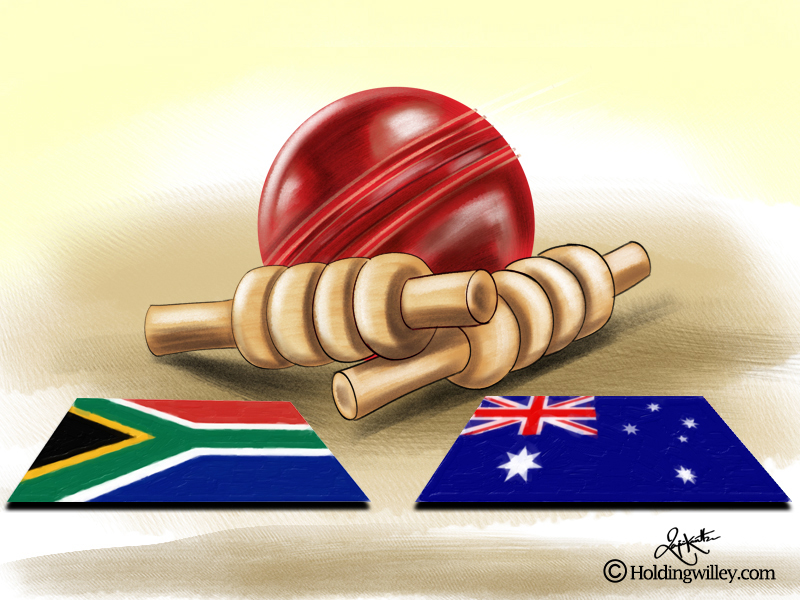 South Africa’s bowlers took 5 five-wicket hauls compared to Australia’s bowlers who took only 2 five-wicket hauls. Bowlers win you Test matches and Australia’s bowlers did not hunt as a pack.